We are a mission-driven institution dedicated to expanding opportunities for the underserved in the legal profession, preparing a diverse group of students for leadership roles in the legal profession, business, and government, and offering leadership in teaching, research, and service. For almost 70 years, the Thurgood Marshall School of Law at Texas Southern University has been a catalyst for initiating courageous conversations and a progenitor of equality, diversity, and opportunity in keeping with the values and ideals of our namesake, Justice Thurgood Marshall. As a community of change agents, our law school has empowered the disenfranchised and underserved by preparing lawyers to practice law and to shape social and public policy. In addition, our diverse faculty is a community of prolific and cutting-edge teachers and scholars who emphasize teaching excellence and who produce legal scholarship that enriches, embraces, and celebrates an array of legal issues and perspectives. We wish you well as you begin your journey toward your legal career and welcome you to Thurgood Marshall School of Law at Texas Southern University. The mission of Thurgood Marshall School of Law (“Law School”) is to prepare a diverse group of students for leadership roles in the legal profession, business, and government. In keeping with its rich tradition as an HBCU, the Law School continues to train and educate large numbers of African‐American and Hispanic lawyers. At the same time, the Law School has opened its doors to students from all backgrounds, gaining recognition as one of the most diverse law schools in the country. As part of a special‐purpose institution for urban programming, the Law School is also committed to making an impact on urban communities. 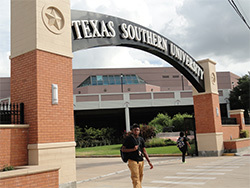 Texas Southern University is a comprehensive metropolitan university. Building on its legacy as a historically black institution, the University provides academic and research programs that address critical urban issues and prepares an ethnically diverse student population to become a force for positive change in a global society. We enhance our preeminence as the Law School of inclusion and opportunity by continuing to rise on our standards of equality and excellence. The following pages present the goals, objectives, action plans, and key performance indicators (KPIs) of TMSL’s 2014 Strategic Plan. Thurgood Marshall School of Law is a public law school founded in June 1947. The School is fully accredited by the American Bar Association. In January of 2014, the law school was admitted to membership in the Association of American Law Schools (AALS). 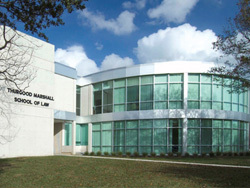 Thurgood Marshall School of Law, Texas Southern University does not discriminate on the basis of race, color, religion, national or ethnic origin, gender, sexual orientation, gender identity or gender expression, age or disability in the administration of its academic or employment policies, or other school-administered rights, privileges, programs or activities. Employers must agree to the Non Discrimination Policy prior to using our services.